LOOKING FOR A CONDO WITH A 2 CAR ATTACHED GARAGE?? Located in Liberty East with 2 BR, 2 Baths, and 1,188 sq ft, this unit has its own patio. The GR offers a corner gas log fireplace. The MBR with 3 piece bath including step in shower while the hall bath is a 4 piece with tub/shower. The eat-in kitchen offers oak cabinets and all appliances. The spacious 2 car garage offers storage cabinets, pull down stairs to attic, and an exterior door to the patio. Unit offers city utilities with a newer gas hot water heater. This is an over 55 community and the Association Fee is $120.00 monthly. Association Fee covers exterior of the units, lawn care and snow removal. Liberty Village has a first right of refusal after there is an accepted offer. 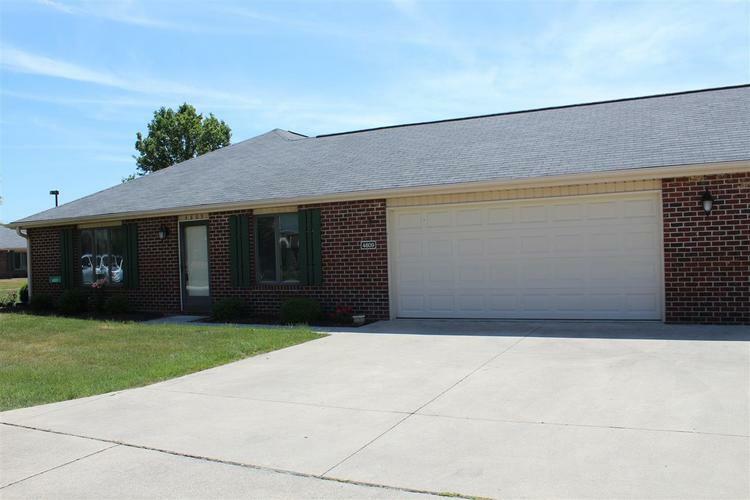 Close to Muncie By-pass and easy access to banking, Village Pantry, Dollar General - short drive to Muncie. Average Electric is approximtely $50.00 and Average Gas is also $50.00. Trash pick up is included in the Association Fee of $120.00 per months. See Association Docs for items paid by the Association Fee. Directions:E. Jackson East to by-pass to Country Club, turn N. to Heritage Circle, West to 'T' Road, South to 1st Drive on right, property on left.